In an effort to make higher education more flexible and accessible to more people, many American colleges and universities offer online classes and even grant degrees for courses of study in which all the course work was completed online. Of the 1,055 college and university presidents interviewed for the Pew Research survey, 77% reported that their institution offers courses for which the instruction takes place exclusively in an online environment. The extent to which online learning has been adopted by institutions of higher education varies widely, and there are significant differences by sector. Two-year colleges are the most likely to offer online course work, with 91% offering online courses. Nearly as high a share of public four-year colleges and universities (89%) offer online courses. Seven-in-ten for-profit colleges and universities (71%) offer classes online. Private, four-year colleges are the least likely to offer online courses, though six-in-ten of these institutions offer courses online. Religiously affiliated schools and highly selective colleges are significantly less likely than other schools to offer online courses. While 65% of religiously affiliated colleges and universities offer online classes, fully 80% of schools without a religious affiliation offer those courses. Among four-year colleges and universities, barely half of highly selective schools (51%) offer online courses, compared with 80% of mid-tier schools and 86% of colleges with low levels of selectivity. While many schools offer online courses, only a minority of students are taking advantage of these offerings. Again, adoption of online learning by students differs across institutions. 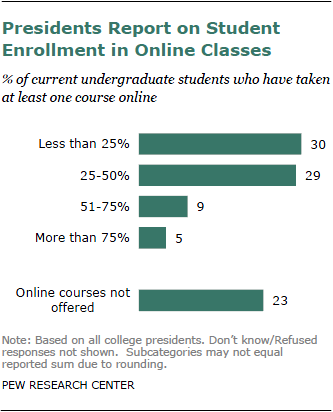 Across all colleges and universities, three-in-ten presidents report that less than a quarter of their currently enrolled undergraduate students have taken at least one course online. Roughly the same proportion (29%) says between one-quarter and half of their students have taken an online course. Only 15% report that more than half of their students have taken an online course. College presidents see the potential for growth in this area. Fully half of those surveyed predict that 10 years from now a majority of their undergraduate students will be taking a class online. The presidents of two-year colleges anticipate the most growth in this area. Roughly two-thirds (65%) say that in 10 years, most of their students will be taking at least one online course (up from 16% currently). A majority (54%) of the leaders of for-profit institutions also predict that by 2021 most of their students will be enrolled in online classes. The presidents of four-year public and private colleges don’t anticipate quite as much growth over the next decade. Among the presidents of four-year public institutions, 45% say in 10 years at least half of their students will be taking an online course (up from 14% now). And among the presidents of four-year private colleges, 37% say most of their students will be taking courses online 10 years from now. According to the Pew Research survey of the general public, roughly one-in-four college graduates (23%) report that they have taken a course online for academic credit. Among recent college graduates, that share rises dramatically. Nearly half (46%) of those who graduated in 2000 or later say they have taken a class online. Black and Hispanic college graduates are more likely than whites to have taken a class online (35% vs. 21%). In addition, graduates who attended college later in life are more likely than those who went to college right after high school to have some experience with online learning. More than one-third (36%) of college graduates who completed college when they were 30 or older say they took classes online. This compares with only 17% of graduates who finished college when they were 22 or younger. In addition, college graduates who majored in business are more likely than those who majored in science, engineering or liberal arts to have taken online courses. Along with the growing prevalence of online learning comes a real sense of skepticism among the public about the value this format offers students. Respondents in the general public survey were asked whether they thought a course taken online provides an equal educational value as a course taken in person in a classroom. Only 29% of all respondents said online classes offer an equal value. Six-in-ten said online courses do not offer the same value as classes taken in person, and 11% were unsure. Views on this issue are fairly consistent across major demographic groups. In spite of the fact that they have grown up in a digital world, young adults are as skeptical about online learning as are their older counterparts. Among those younger than 30, only 28% say a course taken online is equal in value to a course taken in person; 67% say it is not. The same is true for those ages 30 and older: 30% say an online class offers the equivalent value of a class taken in person, 58% say it does not. Most college graduates have a negative view of the value of a class taught online as opposed to one taught in a more traditional classroom setting. Only about one-in-five college graduates (22%) say an online course offers an equal educational value, while 68% say it does not. Among non-college graduates, 32% say online classes are equal in value to classes taught in person. Those who have personal experience with online learning have a somewhat more positive view of its value. Even so, a majority rejects the notion that online classes offer the same educational value as in-person classes. Roughly four-in-ten (39%) of those who have taken an online course say online classes in general provide an equal value when compared with classes taken in person in a classroom, and 57% say they do not. By comparison, 27% of those who have never taken a class online say the value is equivalent to being in the classroom. Compared with the public, college presidents have a more positive view of the value of online learning. Still, they are divided over whether a class taught online provides an equal educational value as a class taught in person. Overall, 51% of college presidents say online classes offer an equal value, and 48% say they do not. Presidents who lead colleges where online learning is part of the curriculum have a much more positive assessment of the value these classes provide than those who oversee institutions with no online classes. Among presidents of colleges that offer online courses, 59% say these classes are equal in value to in-person classes. Only 21% of presidents whose institutions do not offer online classes agree. Looking across different sectors of higher education, presidents of two-year colleges are among the most likely to say online classes are just as valuable as classes taken in person (66%). More than half of the presidents of for-profit colleges (54%) agree that online classes provide an equivalent educational value. Among the presidents of four-year public universities, opinion is more evenly divided: 50% say a course taken online is equal in value to a course taken in person; 48% say it is not. The leaders of four-year private colleges are among the most skeptical about the value of online learning: 36% say online classes provide the same value as classes taken in person, while 62% say they do not. Beliefs about the mission of higher education are linked to presidents’ views about the value of online learning. Those who believe that the mission of higher education is to prepare students for the workforce are more likely to say that online courses provide equal value to in-person classes (59% vs. 40%). Meanwhile, presidents who believe that the mission of higher education is to promote personal and intellectual growth are less enthusiastic about the value of online courses—43% say they are equal in value to in-person classes, while a 56% majority says they are not. Online courses are provided not simply to increase student access to certain classes, but in many cases the courses are offered as a part of a fuller online degree program. Of the roughly three-quarters of American campuses that offer online courses, more than half (58%) offer degrees for programs where all of the course work has been completed online, according to their presidents. Online degrees are most prevalent at for-profit institutions, where 71% offer them, and at four-year public institutions, of which two-thirds (66%) offer degrees for work completed entirely online. Among two-year colleges that offer online classes, 54% also offer online degrees, and among four-year private schools, less than half do so (47%). Institutions that do not offer full degrees for courses taken online are less likely to have a large percentage of students taking online courses. Half (54%) of schools where less than one-quarter of students take online courses do not offer online degrees. In contrast, 82% of schools where at least three-quarters of the students take online classes offer degrees for work completed entirely online. While many online courses are designed to facilitate distance learning for those who cannot or choose not to be on campus, many campuses now have a substantial number of on-campus students taking courses online. According to their presidents, half of universities and colleges that offer online courses make at least some of those courses available for their on-campus undergraduate students; 7% do not make these courses available; and 42% do not have residential students. Of residential colleges that offer online classes, 88% offer online courses to on-campus undergraduates, and 12% do not. On-campus online courses are more prevalent at four-year public schools (96% offer these classes to their residential undergraduate students) than at four-year private schools (73%).